Mommy Gossip: Photo Story Friday—All About Moi! Photo Story Friday—All About Moi! I am very excited, because not only was I tagged by Hannah from That Girl and Tena from Punkey's Monkey, but I just found out that Kellan is featuring me over on her site On the Flip Side. Between this info here and that info there, you will know more about me than you ever dreamed of wanted to! Enjoy! Red Rover swinging is the sixth pic in my photo album. Not one to really keep the rules, I am adding a fun one of Chatter Box as well. My baby sis Brooke at CrazyinCollege, took and Photoshopped these. She rocks! I had tons of freckles when I was little and hated them. My mom took me to the zoo and showed me the giraffes. I fell in love with them. She pointed out that they had freckles too. Since then, I have loved not only giraffes, but freckles. T-Daddy and I are in a fun competition to see who can visit all 50 U.S. states first. I am at 43 states and ahead of him by 2. I have had 24 staples in my stomach and 42 staples in my head. Does anyone wonder why I HATE even numbers??? I have 4 screws in my jaw. Nope! I don't set off security alarms. Just look like FrankenJyl in an X-Ray. I love to chop. I returned a very expensive Cuisinart veggie chopper (or whatever they are called) I got for my wedding, because I knew I'd never use it. One of my favorite experiences ever was sea canoeing through a bat cave in Thailand. My favorite part of being a foreign exchange student in Argentina was meeting my very best friend Heather. Our relationship has lasted more than 20 years and is one of my greatest blessings :). This is supposed to be 4 things I did today, but since I hate even numbers and don't follow rules, I changed it to 5! Waited at home while my T-Daddy took Red Rover to the ER. Dehydration and major stomach virus! YUCK! Spent an hour on the phone with AT&T/Apple to resolve my iPhone's dropped call issues and why "Brandon Clark" instead of my name appears on people's caller IDs when I call. Made Chatter Box a Peanut Butter & Jelly sandwich for lunch. Vacuumed the whole upstairs. THANKS ROOMBA!!! Helped Red Rover with his piano theory homework. Take my kids to Gardner Historic Village to see the cool witches and to get a pumpkin-shaped sugar cookie. Do a load of whites. Watch House with T-Daddy (favorite way to end the day). Note that these only make me feel guilty, because I have to spend our hard-earned money to do them, when I could be, say, paying off the car loan or whatever. Talking on the phone with friends forever!!! And lately, meeting lots of other mommy bloggers and chatting with them real time at Twitter Girl's Night Out on Tuesday nights. Do those little robot vacuum things actually work? It seems a little weird to me that it can maneuver itself around a whole room. And lastly, I hope you boy's okay soon! you DO realize there are about 1,000,000 blog posts in all those neatly packaged facts about you? hope the little twerp is feeling better soon. keep the liquids flowing...popsicles count! ACK! I'm BLIND! You posted a picture of a pedicure! I want a pedicure. Sounds like fun! My sis and I have TONS of freckles that we cover up with makeup and fake tans. Spending time in a bat cave sounds skeery. And, I hope your son is better very soon! Sea canoeing - that's pretty darn impressive! Fun learning all these things about you! The Thailand trip DOES sound so AWESOME! And the ER trip? OH MAN, not fun at all!! Your list of guilty pleasures are all those I would choose!!! What a great tag post! Love the pedicure pic! Loved finding out more about you! :) We have a lot in common! omgoodness. I finally gave up on my iphone. I wanted to run it over wiht my car. there is a known service issues with the older iphones. I kid you now. I just got a blackberry curve that I am testdriving right now. I get pedicures frequently...it's my escape!!! I was JUST telling my sister that I wanted to go to Gardner Village tomorrow!!! Sorry about all your even metal. And about your sickie. I loved your answers in the tag.. I am sorry your little guy is sick..
this was such a fun and wordy post oh and the pics so. much. fun. i soooooo want a rumba!! Wow! Packed a lot of great info into this post! First, I have freckles on my nose - always have. Hated them too when I was little, but now I love them. My parents are visiting Thailand as we speak. I'd love to go someday. Peddi's rock. Seriously. I try to get them every couple of months. It's my one little treat to my toes! Wow! Who knew you could fit so much into one post? Hope Red Rover feels better soon. Love the pics. I have had 30 staples and over 50 stitches!! Ha ha - love that! I hope you little guy feels better soon. Keep up the Popsicles and Jello too. The photo editing turned out great! I love the swing photo a lot. oh MAN I haven't had a pedicure in SOoooooooo long!!!! --- did you tag anyone?? I checked your story over at kellan's. I wrote a lengthy comment so this will be short. That explains why we're all so attracted to you! It was very hard for me to keep reading after the 42 staples...holy cow! Loved reading all about you. I love pedicures too-I really need one soon. Hope your little guy is doing better. Hope I can join you guys again soon for GNO, I have a temple recommend interview Tuesday night, but I'll try to join in when I get home. Wow what fun things to learn abt you. Do you love that roomba thing? I've wondered abt them. you like to chop?! Hmmmm.... interesting! And the bat cave thing? Perhaps a whole post on that! I feel guilty about all those things EXCEPT the books. Noone can ever own enough books. My personal mantra is "Where ever you go, buy a book." Can you tell we're all big readers over here. I've also decided not to feel guilty about my massage. I feel I earned it with my half marathon running! Aw... the Giraffe story. PRECIOUS!! It really warmed my heart. Hey! Hope you had a great weekend! There's an award for you over on my blog! Come check it out! 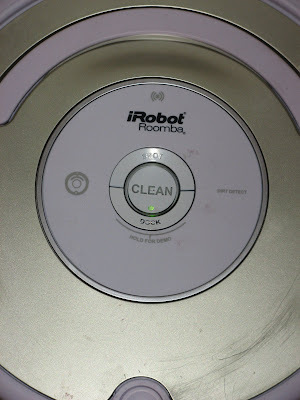 Are you telling me the Roombas work? Now I HAVE to get one! awww, I love your freckle story!!! I too have tons of freckles, just love love love this story with the giraffe's! !